Penny & Giles Ltd, a division of Curtiss-Wright have launched the NRH271 and NRH272 family of no-contact, Rotary Position Sensors, offering the optimal combination of performance, safety and cost. All variants utilise proven Hall-effect sensing technology and are accommodated in a low profile (9.5mm) housing with a compact footprint of just 36 x 35mm. The electrical output span can be set to correspond to rotations of 20° to 360°, and the positional information is determined by the angle of the supplied magnet relative to the sensor body. The maximum air gap between magnet and sensor is 7mm, while concentric offsets of up to 2mm can be tolerated with minimal impact on output linearity. The magnet can be supplied in a convenient carrier, housed in a bolt, as a plug or loose. A choice of power supply options are available – one for connection to a regulated 5V supply and the other to a varying voltage in the range of 9-30V, such as a vehicle’s battery. The NRH271 range has a single output, while the NRH272 has a second, redundant output. In addition, the NRH272 contains two completely independent measuring circuits, each with its own power supply, meaning high-performing, safety-critical applications can easily be addressed. Furthermore, both models contain on-board diagnostic functions that mean the outputs can be put into safe, pre-defined states should an internal sensor error be detected. The versatile, factory-programmable electronics can be easily set to one of two analog voltage output ranges or one of three PWM frequencies. In addition, the polarities of each of the analog outputs can be independently set. 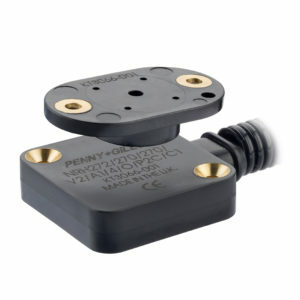 A fully encapsulated design offers exceptional levels of performance with respect to water and dust, shock, vibration and temperature, meaning the sensor is ideal for use in hostile, on- and off-highway vehicle environments. Connection options are industry-standard AMP Superseal or Deutsch DT04 series connectors, or simple flying-leads for customer termination. The sensor can also be supplied with a protective conduit for the cabling.